Zucchini: Cut stem tips of zucchinis off and discard. Slice lengthwise into two pieces. Take a teaspoon and hollow out each half... scraping away seeds and core until smooth. Be sure to leave about 1/4 inch of flesh or the flute will be too weak. Set on baking tray. Mousse: Put the ricotta, basil, garlic, and half of the shredded Parmesan cheese into a food processor and blend until creamy. If too thick... add just a dab of olive oil. But not too much as you need the mousse to stand firm in the zucchini flutes. Once you reach the desired consistency - scoop the mousse out of processor into a zip lock baggie or pastry bag. If using a baggie, snip off about 1/4" of the corner and squeeze baggie to pipe out mousse into the hollowed section of the zucchini. Stop short of the end by about 1/2", as the ricotta will expand when baking. Sprinkle remaining Parmesan cheese along the top of flutes. Put tray of mousse-filled flutes on middle rack of oven, baking for 20 minutes at 375 degrees. 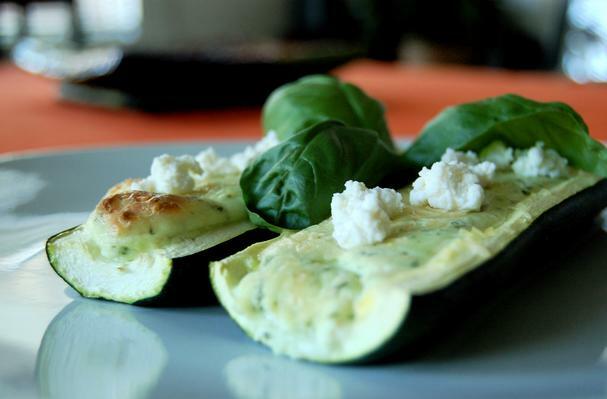 Remove when zucchini is tender to a fork and the cheese has browned slightly. Once flutes are removed from the oven, sprinkle a few ricotta crumbles across the top and lightly drizzle with extra virgin olive oil. Serve immediately. This delicious side dish has morphed over the last few times I've made it... trial and error play a big part in creating dishes.... at least, when I'm creating dishes. But I believe this one has finally become what just might be something close to perfection. Well close... anyway. One of the beautiful things about zucchini is the range of sizes they come in... the ones I chose for this recipe were roughly 4-5 inches in length... with the intention of using them as a compliment to an entrée. *But, as you will see in the recipe... with a few modifications, they can be used as a main dish. Just go to your local Farmer's Market and grab a few of the big daddies... they can grow to be a full foot long and 2-3 inches in diameter.